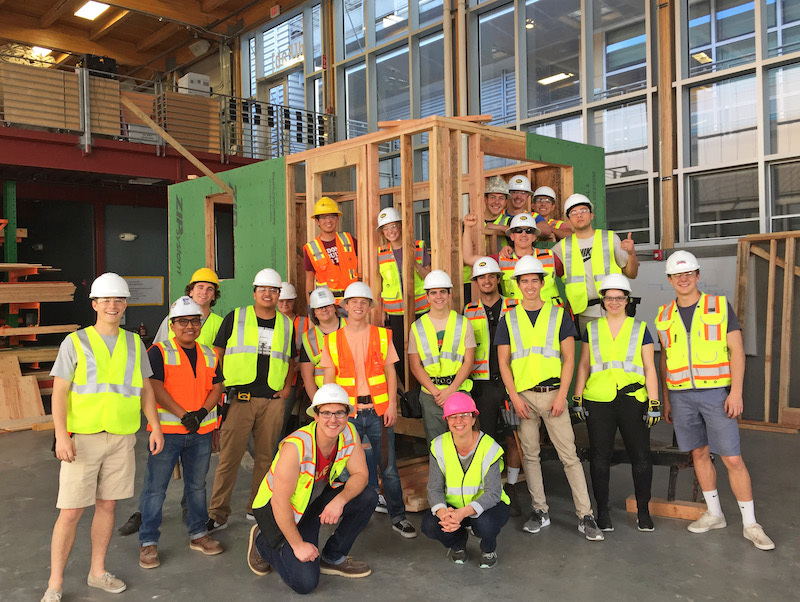 SAN LUIS OBISPO — Construction management students in Cal Poly’s College of Architecture and Environmental Design recently put their skills to work constructing miniature cabins on wheels for a local nonprofit organization. In past years, students have built what has lovingly been deemed the “tiny house” as part of a 10-week-long course, which culminates in an auction of the homes through Cal Poly’s surplus department. During winter quarter, they did something different: The students partnered with local nonprofit Hope’s Village to donate two structures to the homeless. Hope’s Village provides sustainable community living assistance for homeless individuals on the Central Coast. The organization’s “Cabins on Wheels” program provides the homeless with a structurally sound, well-insulated, safe and dry place to sleep. The “tiny house” is a mini structure with subfloor, windows, siding, a roof and door. Miniature cabins on wheels made for Hope’s Village are each close to 77 square feet. Construction management faculty members Stacy Kolegraff and Eric Brinkman led their CM 214: Residential Construction classes in building the miniature structures. The students built the waterproof structural shell of two cabins, while additional volunteers will complete the interiors. Cuesta College and Nipomo High School students are also constructing miniature cabins for the organization. Hope’s Village provided trailers to the classes, on which the students built the two structural shells over two weeks. The structures were built out of standard lumber, with fasteners donated by Simpson Strong-Tie, and exterior sheathing donated by Huber Woods. Students learned about framing, roofing and waterproofing. The students had to design and build around special features including framing around wheel wells and working with different-sized trailers. The student-built structures were towed off campus during spring break and delivered to the Hope’s Village organization. Once completed, they will eventually be placed at an undetermined site. Construction management student Jimmy Fewell, from Novato, California, is continuing to work with Hope’s Village as part of his senior project. He is working to finish the siding for the two tiny houses so they’re watertight and weatherproof. “I chose to finish the siding because they were not yet complete and needed to be moved out of the weather,” Fewell said, “and I wanted to see it through so that these trailers are watertight for Hope’s Village. Hope’s Village of SLO is a nonprofit organization dedicated to establishing a safe, healthy and drug-free village where people who are homeless with little or no income can live in dignity and in peace. Founder Becky Jorgeson can be reached at beckyrjorgeson@yahoo.com. Learn more about Hope’s Village at http://www.hopesvillageofslo.com/home.html. The Construction Management Department — soon to be celebrating its 50th anniversary — is one of the most respected programs in the country. With more than 500 full-time students, it prepares graduates to lead project teams of other professionals in the completion of complex infrastructure projects. These graduates are actively recruited by more than 200 firms spanning the globe. For more information, go to www.construction.calpoly.edu.